“The Best Exotic Marigold Hotel” begins with a gray clamminess, where seven English characters work to leave behind their current surroundings for something new. As the film develops, the seven will learn, in humorous fashion, the perils of getting what they wish for. The characters each encounter an online advertisement for an Indian retirement facility called “The Best Exotic Marigold Hotel for the Elderly and Beautiful” in Jaipur, India. They decide to move there and live out their ‘golden years’ in Indian splendor, despite having never seen the site. Muriel, played by Maggie Smith, is going because she has been promised a crucial surgery at a fraction of the cost in the United Kingdom, but she plans to return home. Her offhanded disgust at anyone without white skin makes her a poor fit in India. This becomes just one of the film’s many intersecting plot lines. The owner, operator, and very soul of the Best Exotic Marigold Hotel is Sonny Kapoor, played by Dev Patel. Patel, an English citizen of Hindu ancestry, came to prominence as the lead in 2008’s “Slumdog Millionaire.” As Sonny, he must maintain a furious pace as a young man continually promising more than he can deliver. He manages all this with a perpetual smile and winning humility. Each actor in the ensemble cast contributes to the richness and humor of the movie, but only a few stand out. Tom Wilkinson’s character, Graham, unlike the others, is returning to India after decades away from it. He’s a friendly man with a ready grin, helping the others settle in. But his eyes sometimes narrow or shift away from the person he’s talking to. He keeps secrets he’s afraid to share. India will challenge him to reveal his true colors. Judi Dench plays Evelyn, a housewife from a comfortably posh background, who has never held a job in her life. She seems unassuming at first, but her mild manner hides a spine of steel. Confronted with the complexities of this new life, some of the characters grow depressed and hide in their rooms. But Evelyn wakes up every morning and strides out into the world, determined to master her environment despite linguistic, geographic, and cultural barriers. The surroundings play a vital role, thanks to director Madden and his director of photography, Ben Davis. The city of Jaipur is painted as a dazzling place awash in bright colors, and holding surprises — some pleasant, others less so — around every corner. 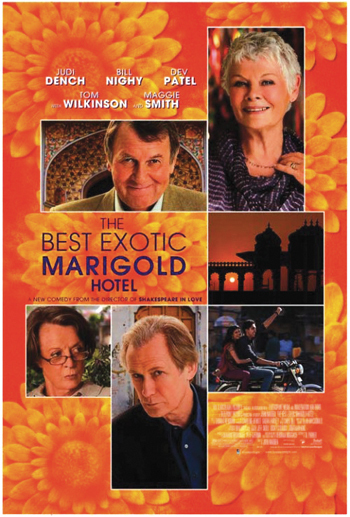 “The Best Exotic Marigold Hotel” opens Friday, May 11, at various theaters around Seattle. Check local listings for prices and showtimes.